This beautiful mommy's necklace boasts two 1/2" round sterling silver charms hand stamped by me with the names of your choice. A 5/8" sterling silver disc is stamped with the initial you choose in my elegant new monogram font, then set in a solid brass bezel setting to make a gold-rimmed monogram piece. What date is special to you? I'll stamp it on the sterling silver rectangle bar charm and accent it with a white wire-wrapped Swarovski pearl. A solid brass key heart charm finishes off this gorgeous charm necklace. Everything hangs on a sterling silver cable chain in your choice of 16 or 18" in length. See picture 4 above for size reference. 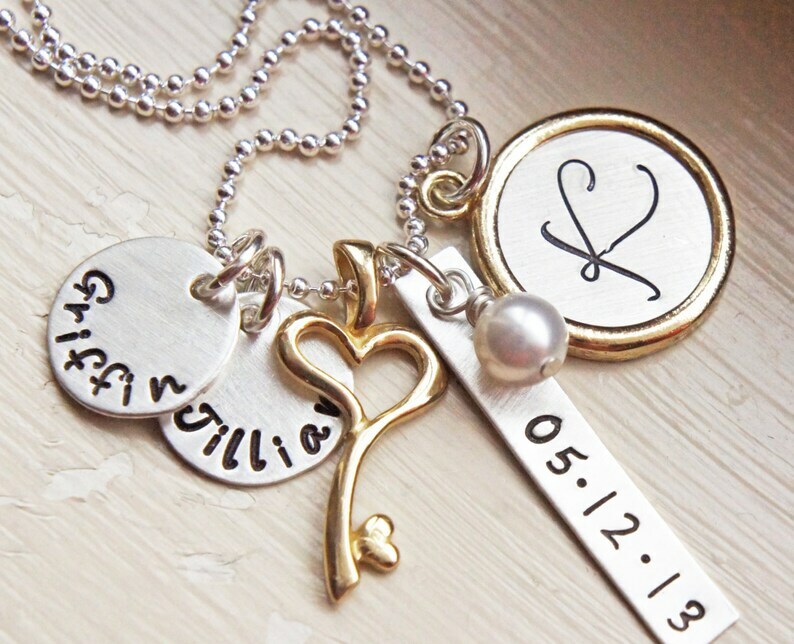 Need to add another name or date charm? Convo me ("contact" button at right, under my profile picture) for a custom listing. Sterling silver and brass naturally darken over time but are easily shined to new with a polishing cloth. Please contact me before purchase for current production time if time is an issue.